This week’s challenge was to create a scratch off game. I wanted to come up with an idea that worked like a scratch off game card, but using something other than a card. I started thinking of other things where you could remove something to reveal something different below. I thought about cleaning something, or a hidden secret message and then I thought about brushing teeth. I’m always after my son to brush his teeth more often, maybe this would inspire him. I drew a little boy’s face, body and arm holding a toothbrush in Illustrator. I converted the slide into a drag and drop interaction with the arm as the drag item and his teeth as the drop target. I gave him a dirty, plaque-filled smile, that had four progressively cleaner states. 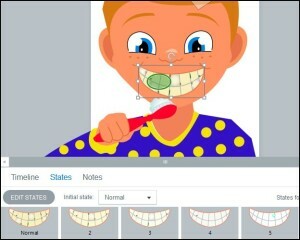 I placed a hot spot on the left side of his mouth and I made a variable that would count the number of times the toothbrush passed over the hot spot. 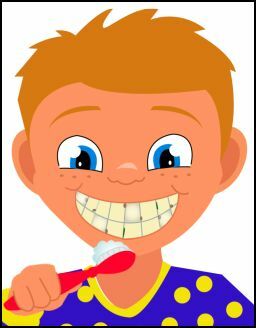 Each time the brush passes over the hot spot, the state of his teeth gets progressively cleaner, until he has a sparkling, clean smile. I also adding some brushing sound effects when the brush passes over his teeth. Noticing how the boy’s arm could be pulled unnaturally anywhere on the slide, I made a second hot spot above his head. If his arm was yanked past this point it would cause an unexpected reaction. Here’s my tooth brushing interaction. I showed it to my son, Ryan, hoping that he would take the hint and start taking better care of his teeth. He just looked at it and said “That’s messed up”. Oh well, at least I had fun making it.